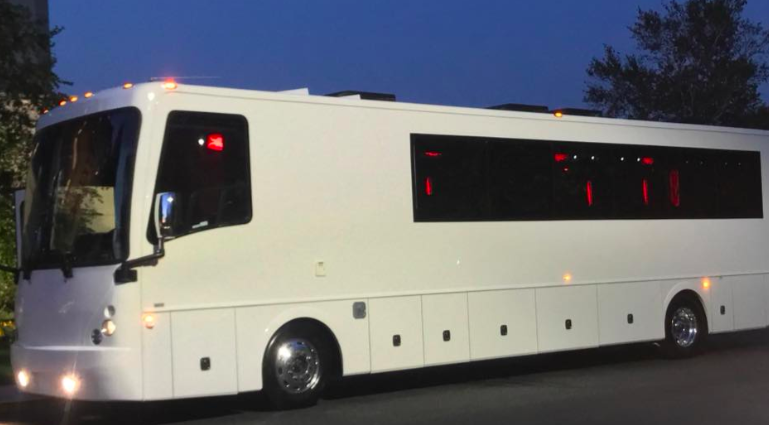 Comfortably seating 38 people, this White Diamond 40 passenger Party Bus was custom designed by Legend Limousines, Inc. with every need our client’s may have. The exterior of the bus is a solid, “White Diamond” color, (selected to match well with our Bentley or Cadillac Limousines). The tinted, frameless windows give the bus a sleek and modern look. For those concerned with the environment, we added an oversized generator to power all of the amentities inside, (perfect for tailgating or for business meetings). The generator allows the bus to sit idle for hours without the main engine running, burning less than one gallon of fuel an hour, and drastically reducing the bus’s carbon foot print. There are giant luggage compartments that provide plenty of storage for bags, or even, extra large coolers. Ground effects lighting surround the bus, and may be configured to any color the client would like. Step inside the bus, and you will be amazed by all of the features. The first thing you notice is the wood floor and finished wood bars and tables. Down the center of the bus are two stainless steel poles, which are easily removed for more intimate gatherings such as Weddings and Corporate outings. The bathroom features porcelain facilities including a urinal, and a corian counter top with working sink. The entertainment package is state of the art! For lights, there is the fiber optic with twilight effect on the ceiling, color changing fiber optic lighting under the seats to light the floor (set to any color you would like), there are 10 black lights, 10 strobe lights, 4 laser lights, a disco projector light, and 6 static lightning dishes. All of the lighting is further enhanced by a fog machine. It is important to remember that all of these features are individually controlled by the passengers, allowing them to create any type of atmosphere that they desire! Mounted on the rear wall of the bus is a 42″ flat screen television, mounted outside the bathroom wall is a 35″ flat screen television, and mounted on the sides of the bus are an additional 5 televisions, totaling 7 televisions! These play DVD’s or Slide Shows. As well, they have USB jacks for computer presentations. The stereo system is equipped with 12 speakers and 6 sub-woofers, which definitely turn the bus either into a luxurious movie theatre, or a night club on wheels. So whether your moving a large bridal party with style, hosting a corporate outing for a long drive, or whether it’s a leisure night out with friends, this vehicle will get you there with style.